Americans believe that knowing how to write well is more important today than it was in the past. They see it as essential to success in college and white collar careers, and as important to success in blue collar jobs. They link learning to write with a host of other learning and intellectual skills. Eight in ten (80%) say there is a greater need than there was twenty years ago for a person to be able to write well in order to succeed. As we have found in our 2005 and 2007 surveys, majorities see learning to write well as essential to succeeding in college (67%) and in white collar and professional careers (65%). Three in ten see writing as essential to success in blue collar jobs (30%), and another 53% see it as important. Majorities also see writing as essential to learning other skills, including learning to read (59%), improving a person’s grammar (59%), learning how to communicate effectively (59%), gaining a large vocabulary (57%), and learning to analyze and bring details together (54%). More than four in ten see learning to write as essential to improving critical thinking (46%), becoming more creative (44%), and gaining organizational skills (42%). 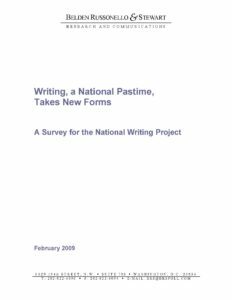 There is room to grow in ensuring that Americans have the writing skills they need for the new economy, according to the 2009 survey. Many are unsatisfied with their own ability to communicate in writing, and most believe that half or fewer of high school graduates have the writing skills they need to succeed at college or at work. Four in ten Americans are less than totally satisfied with their written communication skills. When asked to evaluate themselves on how well they can communicate their thoughts in writing, thirty-five percent say they are satisfied only part of the time and six percent rarely satisfied. Six in ten (59%) are almost always satisfied. A majority gives the quality of writing instruction they received in school a grade of B (36%), C (22%), or below (6%) while only a third give their writing education a grade of A (35%). Only 17% believe that when students graduate high school in the U.S., most have the writing skills they need for college, and only 27% believe that most high school graduates who start work instead of going to college can write well enough to do their jobs effectively. Confidence in college-level preparation is higher, as six in ten (62%) believe that when students graduate college and start work, most can write well enough to do their jobs effectively. The widespread belief that high school graduates lack the writing skills they need may lead a majority of Americans to support more emphasis on writing in public schools. Evidently the public does not believe it is acceptable to wait for college to teach students to write well. Three quarters (75%) say that our public education system from kindergarten through high school should put more emphasis on teaching students to write well, while only two in ten (22%) believe it puts enough emphasis on writing already and just two percent believe there should be less emphasis on writing in public education. What would it look like for America’s schools to do better at teaching their students to write well? According to the public, it would mean helping teachers more rather than testing more, teaching reading and writing at the same time, beginning to teach students to compose sentences and paragraphs relatively early, and using computers to help students learn. Attitudes on these questions have changed little since we first asked them in 2007. By a margin of two to one, the public sees more benefit in putting resources into helping teachers teach writing (66%) than in putting those resources into testing students to see how well they are learning to write (33%). By a margin of three to one, Americans believe that writing and reading go hand in hand so students should learn them both at the same time (74%), rather than believing that children need to learn to read in order to learn to write (25%). Begin to teach writing by second grade: A large majority of Americans believes that second grade (20%), first grade (29%) or even earlier (18%) is the right time to start teaching students to write. The public is still ambivalent about the role of new technology in learning to write. Fifty-six percent say that computers and other new technologies are helpful in teaching students to write well, while 39% say they are harmful. At the same time, 51% agree that using computers to write makes students careless writers because they write so fast they do not think enough about what they are writing, compared to 47% who believe that computers enable students to become better writers because they write, revise, and edit more.